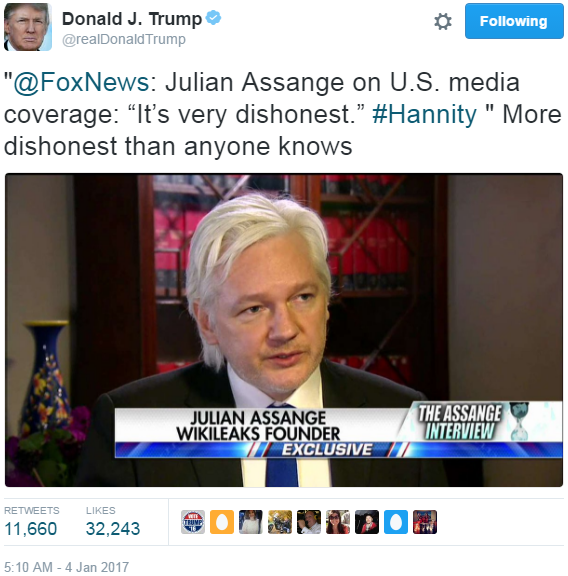 Julian Assange, who is most infamously known as the founder of an internet clearing house for “leaked” data, appears in an interview broadcast on mainstream media to warn us all that the U.S. media is very dishonest — more dishonest than anyone knows. Trump live-tweets the show, also using U.S. media. There isn’t enough gin in the world to make me feel good about the idea that Trump thinks Julian Assange, abetted by Sean Hannity, is now setting the bar for honesty in this country.